What Is Desktop App Assure? Fix issues customers encounter with Microsoft products (e.g., Office macros and add-ins). The service is free to all eligible Windows 10 Enterprise and Windows 10 Education customers (150+ seats with the following qualifying SKUs: Windows E3/E5/A3/A5 or Microsoft 365 E3/E5/A3/A5) that have signed up for the also free FastTrack service. It is available in Preview Mode since October 1st, 2018 for North America (English only) and will go into General Availability on February 1st, 2019. Microsoft partners can also submit requests on behalf of their customers. Microsoft’s Application Compatibility Promise: 99% Compatibility! We recently made a promise I’ve been hoping to make for a long time: if an app works on a previous version of Windows and, when you update to the latest version of Windows 10, it stops working, we’ll fix it for free. This is a big deal to me personally, because we’ve finally found a way to share the risk. [...] Your organization still bears the risk of validating that applications work, but if something fails, then we accept the risk of finding a way to remediate the app! We could fix Windows itself, work with the vendor who wrote the app, or suggest a code change. And I think that’s a really big deal. Windows 10 desktop and web apps. Let's go through a couple of scenarios in more detail. For an in-house developed custom app, Microsoft could switch off a certain Windows behavior that causes the application not to work, suggest changes to be made to the source code to avoid switching off a certain trouble-causing Windows 10 behavior, or provide a custom app compat shim that can be applied directly or merged into an already existing shim database if the source code is not available. To improve the future compatibility of ISV software products, Microsoft will also engage with third-party vendors and share the troubleshooting results with them in the hope that they will make adjustments to their product to avoid further issues. In some cases, Microsoft is also willing to make adjustments to Windows 10 itself to eliminate the problem. Even if you took on some technical debt when migrating to Windows 7 by deploying a 32-bit version of Windows 7 and now you want to move to a Windows 10 64-bit version, the Desktop App Assure program can help you remediate that app too. However, it will not provide assistance with creating your application inventory, testing which apps work and which don't with Windows 10, researching third-party app compatibility and support statements for WaaS, or application packaging-only services. This is where it gets hairy. Microsoft is very clear that it will not make changes to your application's source code, but only provide guidance to your developers "if the source code is available" for it. However, the out-of-scope statement also says that the App Assure team "packages apps that we have remediated for Windows 10 to ensure they can be deployed in the customer’s environment." (see screenshot below). We assume that this means that Microsoft will create a package for the application for FastTrack to test internally, but will not share that package with you. In addition to the above, Microsoft puts limitations on what environment changes will be done. For example, while Microsoft will fix issues for web apps that ran on Internet Explorer (IE) 11 or older versions, Microsoft will not re-write the application to run in Microsoft Edge. 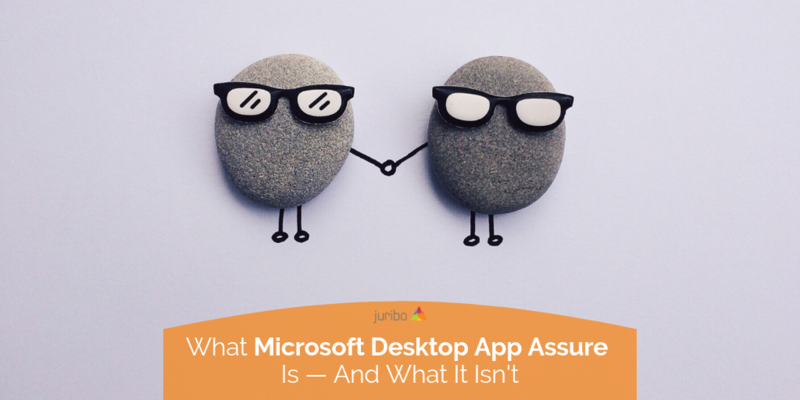 How Should You Use Desktop App Assure? Let's face it: When 21% of the applications failed with moving to Vista, or even to Windows 7 with its much lower app failure rate, it was easier to get support through forums and by seeking out other IT professionals because many people faced the same issues. Now with Windows 10 and an anecdotal failure rate of 0.03%, the chances are slim that you will find another person with the same problem. Having a Microsoft team ready to jump in and solve the hard application compatibility issues is not only a confidence boost but also somewhat of an insurance policy which you should take advantage of. However, this isn't a magic pill that will make all your issues go away overnight. You still carry the heavy workload of (and the risks attached to) creating your app inventory, testing them, and validating that they work. Luckily, Juriba Dashworks not only works with the Windows Analytics Upgrade Readiness and the Office 365 ProPlus Readiness Toolkit, but also seamlessly fits into working with the Microsoft FastTrack offering by enabling you to build a scalable, repeatable, and — most importantly of all — accelerated process to migrate to Windows-as-a-Service and Office 365 ProPlus, and then seamlessly upgrade to newer versions.